A leaked plan by likely coalition allies 5-Star Movement and League says states should be able to exit the euro zone and cancel debt. That, along with a soaring budget and proposals for a shadow government, promise conflict with the EU. Bond markets are too complacent on Italy. The maverick 5-Star party and rightist League are nearing a coalition. 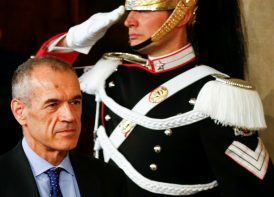 Plans to cut taxes and boost social spending will clash with the euro zone’s strict fiscal rules. The new government may also demand more EU help with migrants. It’s a break from Italy’s pro-European stance. The Bank of England chief’s latest comments made investors doubt he will tighten monetary policy this year. Such scepticism is overdone. The economy doesn’t have to grow very fast to generate inflation and the jobless rate is very low. Rate expectations could shift once more. President Tayyip Erdogan wants to support the lira, which has hit record lows against the dollar. That would require measures to curb inflation and the current account deficit. His efforts to pump-prime growth, especially before June elections, will achieve the exact opposite. The jailing of the country's most popular politician, Lula, and voter disgust at corruption among the powerful will give outsiders with clean reputations a chance to shine in October elections. That's welcome, but could mean needed spending cutbacks are less likely to happen. U.S. President Donald Trump, Italy’s 5-Star Movement and other modern populists are floundering with outdated or bad economic plans. They would do more to help those left behind by globalisation if they used higher taxes to create better jobs and strengthen welfare security nets. The People’s Republic has long defied the economic doom-mongers. In “China’s Great Wall of Debt”, Dinny McMahon exposes the fragility and contradictions of the country’s growth model. It’s a detailed and original reality check on the latest bout of China hype. Candidates in Sunday’s election promise to spend more. But the winner won’t have much wiggle room. If Italy’s primary budget surplus dips below 1 pct of GDP, cutting overall debt will be hard, a Breakingviews calculator shows. Rising interest rates are a further constraint. The economy expanded 7.2 pct in the fourth quarter as it continued to recover from Premier Modi’s shock therapy. Even stronger growth would require healthy banks. A massive fraud makes this harder to believe in, and a fresh embrace of protectionism will be another drag. The republic’s first budget under President Cyril Ramaphosa hiked taxes, an encouraging sign of fiscal rigour. South Africa still has to tackle its structural problems and avoid a junking of its debt. But with reform momentum gathering pace, its debt still looks attractive. Share price movements garner headlines and excite politicians, but not for good reasons. Equity markets play a minor and easily replaceable role in funding investment, and the effect of current values on wealth is almost entirely psychological. They deserve less attention.